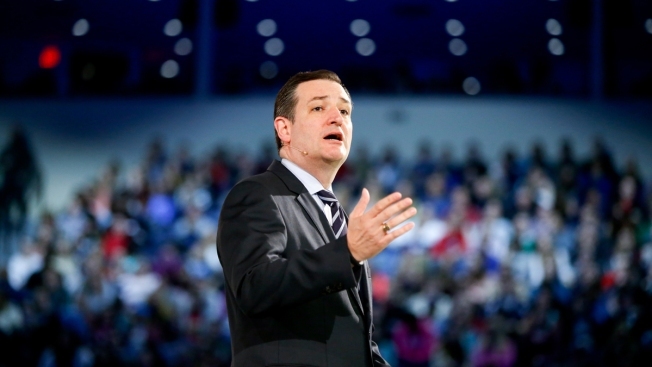 Sen. Ted Cruz, R-Texas speaks at Liberty University, founded by the late Rev. Jerry Falwell, Monday, March 23, 2015 in Lynchburg, Va., to announce his campaign for president. Cruz, who announced his candidacy on twitter in the early morning hours, is the first major candidate in the 2016 race for president. Just days after making his presidential candidacy official, Texas Sen. Ted Cruz is in New Hampshire for a two-day swing. Cruz was the first major candidate to announce a run for president. He made the announcement on Monday at Liberty University in Virginia. On Friday, he attended a rally in Merrimack, New Hampshire, at 3 p.m. He's also scheduled to speak later in the day at the "New England Freedom Conference" in Nashua, being held by the Young Americas Foundation. On Saturday, he is scheduled to speak at a brunch being hosted by the Rockingham County Republican Committee and the Seacoast Republican Women. Cruz has made four previous visits to the Granite State with more than a dozen individual stops dating back to 2014. See those visits and more in NECN's New Hampshire Candidate Tracker.